Anyhow, I think Koster’s argument is fascinating for several reasons. First of all, Koster reveals an archival discovery that Giovanni di Nicolao’s wife, Costanza Trenta, was dead by 1433 (a year before the Arnolfini Portrait was dated!). And from what we know, Giovanni di Nicolao Arnolfini never remarried. So, what does this mean? Koster convincingly argues that this portrait is a posthumous representation of Costanza, a way to remember and commemorate Giovanni’s wife. 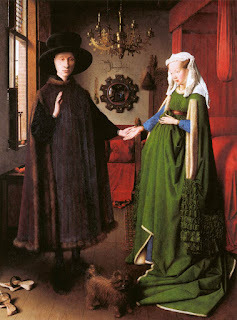 The oath gesture by Arnolfini could reference an wedding oath already taken, perhaps suggesting a renewal of Arnolfini’s wedding vows and devotion to his deceased wife. First of all, the idealized depiction of Costanza stands in stark contrast to the very naturalistic and individualized depiction of Giovanni, which could indicate that these two individuals are separated by life and death. Furthermore, there are other aspects in the painting which allude to death. The roundels circulating the mirror frame (see right) are scenes from the Passion of Christ. All of the scenes which show Christ alive are on the left side of the mirror (near Giovanni), whereas all of the scenes alluding to Christ’s death or resurrection are closest to Costanza. Additionally, the lit candle is placed near Giovanni, whereas the snuffed-out candle is placed over Costanza. The colors of Costanza and Giovanni’s garments could also symbolically allude to their present situation. Costanza is wearing a dress of blue and green: blue was a symbol of faithfulness and green was a symbol of love. Giovanni’s darker clothing can be interpreted as a symbol of mourning or suffering (and Koster further points out that this work was painted before black clothing became fashionable for the Burgundian court). If you’d like to see Koster explain aspects of her argument, check out the beginning of the “Part 5″ section for this documentary. 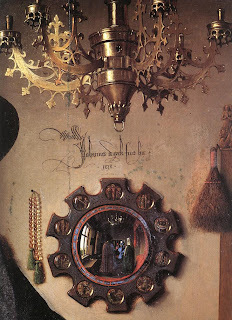 (This documentary on Northern Renaissance art is hosted by Joseph Koerner, another art historian who happens to be Margaret L. Koster’s husband!). What do people think of this argument by Koster? On a side note, I have to say that I’m always surprised when practicing scholars still refer to this painting as a wedding portrait. That Panofskian approach has been questioned by Northern Renaissance scholars for several decades, and even the National Gallery (which houses this painting) shies away from the wedding interpretation. In fact, I thought the wedding debate was settled in 1993 by Margaret D. Carroll, who pointed out that Mrs. Arnolfini is wearing a headdress traditionally reserved for married women.3 Argh. Despite all of the respect that Panofsky deserves, I really feel like we need to stop interpreting this piece as a wedding portrait. Let’s get on with our lives, folks. 1 Margaret L. Koster, “The Arnolfini Double Portrait: A Simple Solution,” in Apollo (Sept. 2003): 3-14. Text available online here. 2 Lorne Campbell, “Portrait of Giovanni(?) Arnolfini and his Wife,” The Fifteenth Century Netherlandish Schools (London, 1998), 174-204 (see especially p. 195). 3 Margaret D. Carroll, “In the Name of God and Profit: Jan van Eyck’s Arnolfini Portrait,” Representations 44 (Autumn 1993): 100-101. When You Have "No Monet"
“A thief in Paris decided to steal some paintings from the Louvre. See if you have De Gaulle to send this to someone else. *Could we make this joke longer? Can you add any more puns using artists’ names (or major French historical figures) from the 19th century? I’ve had Edvard Munch’s The Scream (right, 1893 version, also known as The Cry) keep popping into my mind lately. This week I’m getting ready for an extremely busy spring quarter, which will start next Monday. Although I know that the workload will be manageable (I’m too organized to let things become unmanageable! ), this image keeps coming to mind when I look at my upcoming calendar. There’s so much work to be done! I thought I’d share my two favorite things about this painting (well, I should say that there are four versions of this painting, but I especially like the 1893 version). My favorite art historical argument about The Scream was put forth in 1978 by Robert Rosenblum.1 Rosenblum argued is that the screaming figure was inspired by a Peruvian Mummy, which Munch would have seen on view at the 1889 Exposition Universelle in Paris. This mummy, called the “momie trépanée,” is now located in the Musee de l’Homme in Paris (see an additional image of the mummy here). It is thought that Gauguin also saw this mummy on display; the old woman in his painting Where Do We Come From? What Are We? Where Are We Going? (1897) bears a strong resemblance to the mummy’s features and fetal position. 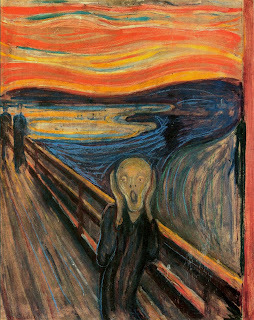 I also love that The Scream has quite a history when it comes to art crime. Versions of The Scream have been stolen from the National Gallery in Norway (in 1994) and the Munch Museum (in 2004 – Wikipedia even has a photo of the thieves with their loot!). I think the 1994 story is especially interesting; a few years ago I read The Rescue Artist by Edward Dolnick, which discusses the theft and recovery in detail. If you’re interested in art crime, I’d recommend this book. Essentially, two thieves simply propped a ladder against the window of the museum, shattered the glass, and stole the painting around 6:30 in the morning. The crime occurred on quite a historic day, 12 February 1994, the opening day for the Olympic Games held in Lillehammer. The painting was recovered in May of that same year. On a side note, I wanted to point out that The Scream was originally titled Despair. (This original title doesn’t surprise me, since it seems like Munch experienced a lot of despair and turmoil in his personal life.) I have to say, though, that I don’t feel despair when I think about the upcoming spring quarter. Actually, I’m quite excited about it, even though I know it will be very busy. 1 Robert Rosenblum, “Symbols and Images of Edvard Munch,” (National Gallery of Art, Washington, 1978). Lavinia Fontana Post on 3PP! Hello everyone! I wanted to let people know that I have written a guest post on Lavinia Fontana and self-portraiture at Three Pipe Problem. This fantastic art history blog is regularly featuring posts about women artists, and I was very pleased to contribute to the series. 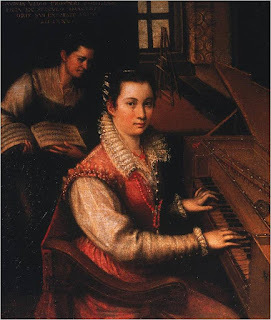 This post was very fun for me to write; I regularly discuss Fontana’s self-portraiture (including her Self-Portrait at the Spinet, 1577, shown left) with my Renaissance students. If you want to see a sneak-peek at some of the topics that I discuss in my classroom, check out the post! Over the past few weeks, my students and I have been discussing some of the ironies regarding the avant-garde tradition. One of the biggest ironies is that although avant-garde artists are radical and break away from tradition, the avant-garde is also reliant upon tradition. Without the conservative Academy, the avant-garde would have nothing to react against. Hence, avant-garde art will never be able to break completely free from Western artistic tradition, because it would become meaningless without that context. Today I’ve been thinking about this irony in relation to Picasso. During the outbreak of the Spanish Civil War in 1936, a stray shell broke the defenses of the Prado Museum. Picasso was very concerned about the masterpieces in the museum, particularly the work of artists like Goya. But the artist had added motivation to be concerned: this same year Picasso accepted the honorific title of Director of the Museum, which was bestowed on him by the Republican government. Picasso’s acceptance of this title is an indication of his sympathies with the Republican government (in case you think his attack on General Francisco Franco via his etching The Dream and the Lie of Franco Part 1 (1937) isn’t enough evidence of his political leanings! Ha!). As director of the Prado, Picasso managed the removal of several masterpieces from Madrid to Valencia. Two years later, Picasso contributed part of his personal funds to have these paintings removed once again to safekeeping in Geneva. 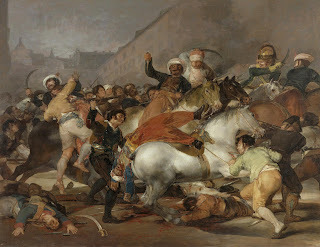 For the most part, the paintings were kept safe, although Goya’s Second of May 1808 (1814, shown right) and Third of May 1808 (1814) were both severely damaged by a falling balcony. The Prado reports that some damage was intentionally kept on the left corner of Second of May as a reminder of the Civil War. Of course, on one hand, it isn’t surprising that Picasso was concerned about the masterpieces in the Prado collection. After all, as an artist, Picasso undoubtedly appreciated the work of other artists. But could there be another reason why Picasso was invested in preserving this art? Think about it: what would Picasso be if artistic masterpieces did not exist? The radicalism in his own art wouldn’t make sense. His commentaries on artistic tradition (and his rejection of those traditions) would have no meaning. Picasso needs masterpieces and tradition in order to stylistically reject them. In this light, one could say that Picasso was helping his own career when he helped to save the work of earlier masters. The continued existence of masterpieces would help ensure that Picasso’s art held meaning and relevance. I wonder if Picasso realized this ironic fact.